AquaSnap allows you to assign a new function to every clickable element of the window frames. We call this a mouse shortcut. 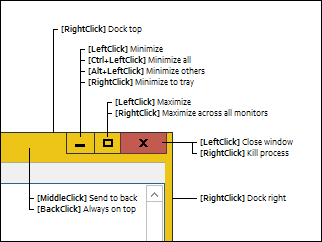 A mouse shortcut permits you to trigger a specific action by clicking with a given mouse button (up to 5 mouse buttons are supported) on a specific area of the window frame ( minimize, maximize and close buttons, borders and corners of the window, etc.). Modifier keys (Shift, Ctrl, Alt) can also be used. 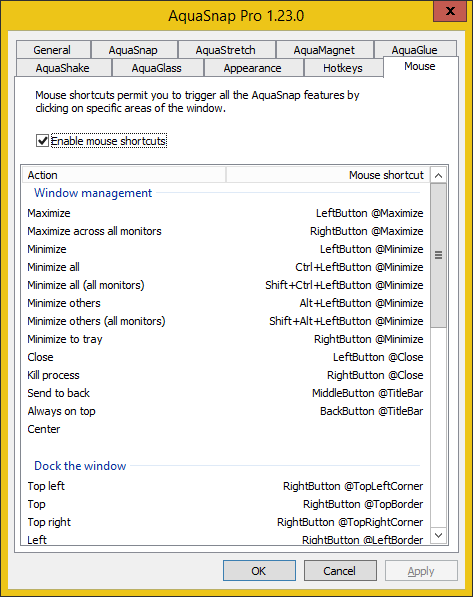 Enable mouse shortcuts: if enabled, user defined actions can be triggered by clicking on specific areas of the window borders. The default value is enabled. Mouse shortcuts: this is the list of the available mouse shortcuts. Double-click on the mouse shortcut that you want to change. Use the small popup window to configure the mouse shortcut.